Ford is expanding its industry-leading range of fuel-efficient powertrains with the addition of an all-new 1.0-litre EcoBoost three-cylinder, developed in Europe – the smallest engine Ford has ever built. Additionally Ford confirms that its next generation of hybrid vehicles, including the C-MAX in 2013, will have a Ford-designed, engineered and built CVT transmission. The arrival of the latest member of the EcoBoost family, and Ford's new hybrid transmission, will further strengthen the company's line-up of fuel-efficient vehicles. Introducing the powertrain newcomers, Derrick Kuzak, Ford's group vice president of Global Product Development, said the three cylinder in-line powerpack was developed in Europe for worldwide application and is a significant addition to Ford's EcoBoost range of engines. "In the last five years, we have made a record investment in new powertrains and fuel-saving technologies," he said. "Today we have the freshest powertrain line-up in the industry. And there is plenty more coming." 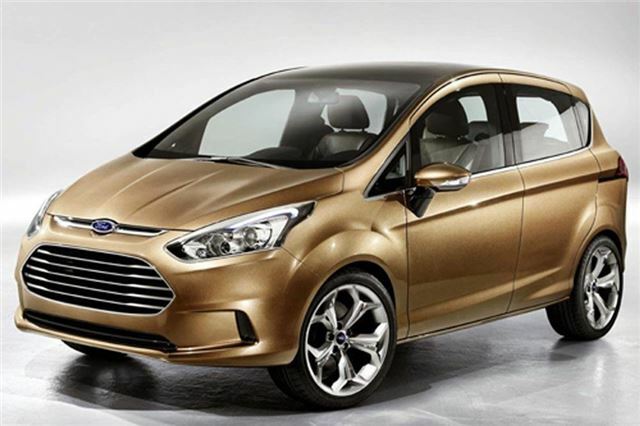 The new engine has already been confirmed for the new Ford B-MAX, which goes on sale in the UK during 2012, and is also destined for global applications on a number of the company's other small cars. Engineers at Ford's Dunton Technical Centre in the UK were responsible for developing the new EcoBoost 1.0-litre as a cornerstone of the ambitious EcoBoost petrol engine family. Technically advanced, it is a super-efficient three-cylinder engine that delivers the same performance as a four-cylinder, but with much higher fuel economy and lower emissions. To achieve this, engineers at Dunton, Essex, Ford's global centre of excellence for small-capacity engines, focused on improving thermal efficiency and reducing friction of the engine's internal moving parts, especially during warm-up. That is when an engine emits higher levels of CO2 and other pollutants. The new engine introduces many new technologies that could be part of the DNA of future Ford engines. Joe Bakaj, vice president of Global Powertrain Engineering, said the new 1.0-litre engine, might be small in size, but is big on advanced technology. “No one has ever built a three-cylinder engine quite like this.It's one of the most technically advanced and efficient engines we've ever designed,” Bakaj said. “The new engine introduces many new technologies that could be part of the DNA of future Ford engines." For comparison, the newest member of Ford's global EcoBoost engine family has about the same displacement as a touring motorcycle engine. Ford has never before built a regular production car with fewer than four-cylinders. “Drivers are going to like the new 1.0-litre EcoBoost because it delivers great low-speed responsiveness, power, torque and smoothness,” said Bakaj. More details of the new 1.0-litre EcoBoost engine will be released in September 2011 at the Frankfurt Motor Show. Ford has also announced that it is to begin production of a new transmission, specifically for installation in its upcoming hybrid vehicles, later this year. To be manufactured at the Van Dyke plant in Detroit, full production will be under way by the first quarter of 2012. The new transmission replaces a unit currently made in Japan and used today in Ford and Lincoln hybrid vehicles available in North America. The new hybrid transmission is Ford–designed, Ford-engineered and Ford-built. An electronic continuously variable transmission (e-CVT), the new hybrid unit will offer improved performance over the current unit, with a greater top speed on electric only power and a longer range. “It's absolutely essential for Ford to further develop its core competencies in engineering electrified powertrains,” Kuzak said. With this new transmission and assembly of battery packs at our Rawsonville, Michigan plant, Ford will be positioned well to meet the quality and performance requirement of future electric and hybrid vehicles,” Kuzak said.